It was my second night eating out in a row, I was being treated by Dorothy and David my next door neighbours and tonight was in many ways like going home. Twenty years ago mum and I stayed at the Auberge for a week while she paid the deposit for the house that she bought here and that my brother and I now own. Over the years I have eaten at the Auberge many times and Isabel and Fabian have become like old family friends. Fabian is a great Chef having won many awards and Isabel runs the front of house with a seamless ease that belies its complications. They always treat me like a long lost friend, but I have noticed that they have an easy welcoming air with all of their guests, Isabel is happy to stop and chat and Fabian is quick to come out of the kitchen and talk to everyone. I think it would be hard to find anywhere with a more relaxed and homely feel. The dining room is beautiful, it is light and airy with a profusion of interesting artwork on the walls, the colours are subdued and give the room a comfortable feel, and I always feel very happy when I am there. 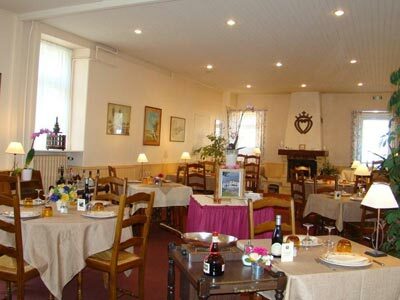 The menu is very good with a wide ranging A La Carte selection. 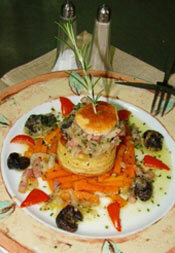 There are set meals at €23 and €26.40 and a large selection on a menu that is €16 for three courses. We had aperitifs while we were choosing our meals, Dorothy and I had Kir Royales made with mûres rather than cassis and David had a beer. With our aperitifs came Mis en Bouche which was a glass with a savoury jelly followed by a layer of finely chopped cucumber followed by a layer of chopped tomato topped with a savoury mousse. It was delicious and even though there was plenty of it, it was so good I could have eaten another one. Dorothy and David had both chosen from the €16 menu while, at their prompting, I had gone for the €26 menu. For entrees Dorothy had chosen a duck pâté while David had decided on the prawns, I on the other hand was eating the Foie Gras de Canard. Dorothy was drinking a half bottle of Pissotte white wine while David and I were sharing a bottle of Buzet Rouge. With my Foie Gras Isabel suggested that I had a glass of white wine from Vix and it was lovely, it is common to drink a sweet white wine with Foie Gras but I find Sauternes or Montbazillac a bit too sweet and often cloying so I was pleasantly surprised to find the wine from Vix to be just slightly sweet and for my taste a perfect accompaniment. The Foie Gras was superb, a large slice served with this slices of smoked duck breast and a decorative garnish, on the side were slices of toasted Brioche which had been made by Isabel, it was sweet, light and perfect. Dorothy was immensely happy with her duck pâté and David was equally pleased with his Prawns. Our main courses arrived with both David and Dorothy plumping for the Lamb, I had a taste and it was superb perfectly cooked, moist and pink. The lamb was served with a sauce giving it a great earthy flavour. My Magret de Cannard was divine, the slices of duck fillet were very pink and tasted as if they were made in heaven, I gave David and Dorothy half a slice each and they were amazed at how brilliantly tasty it was. The duck was topped with caramelised onions and Dorothy was staggered at how well they complimented each other. All three of the meals were served with thinly sliced carrots, sautéed potatoes and mushrooms, all of which as one would expect were cooked to perfection. I had chosen the Buzet Rouge red wine as it is a good value alternative to the heavier and more expensive Bordeaux wines. David is a relatively new convert to red wine drinking and the Buzet is a tasty and softer alternative to its northern counterparts, I actually think it can be a wine of very good quality at an affordable price, and am never afraid to order it, the Le Lys that we were served was a mixture of grape varieties, Cabernet Franc, a touch of Cabernet Sauvignon but with the majority being Merlot and it is this that gives it its soft easy drinking quality. Desserts were a wondrous affair David had strawberries which were excellent, Dorothy had a draining cheese which was a little like cottage cheese it was soft in both taste and consistency and Dorothy loved it. I had the “assiette gourmande” which was a plate with a mixture of desserts the highlight of which was a large slice of chocolate fondant it was the first time I’d had a sliced fondant that was worth eating, it was slippery and intensely chocolaty and was perfectly juxtaposed by the fresh fruit and a large spoon shaped biscuit, I loved it.